As a fan of games and game culture I watch a lot of game related shows on the YouTubes and the Interwebs. One show in particular I enjoy is Continue a weekly show where a group of guys play a classic game for around an hour or so, (the actually episodes are edited down to around 15 minutes though.) Afterwards they'll say whether they'd quit, "game over" or continue playing the game. It's a very entertaining weekly nostalgia trip, but I digress. Every month they do a two part podcast, a sort of a video game book club where they play a longer game, like a classic RPG. This month for a change they decided to actually read a book, Ready Player One by Ernest Cline, a book dripping with 80's nostalgia and video game references. It's also a book that I have resently bought and read myself, pretty much because they told me too, but I'm glad they did cause it is quite the book. 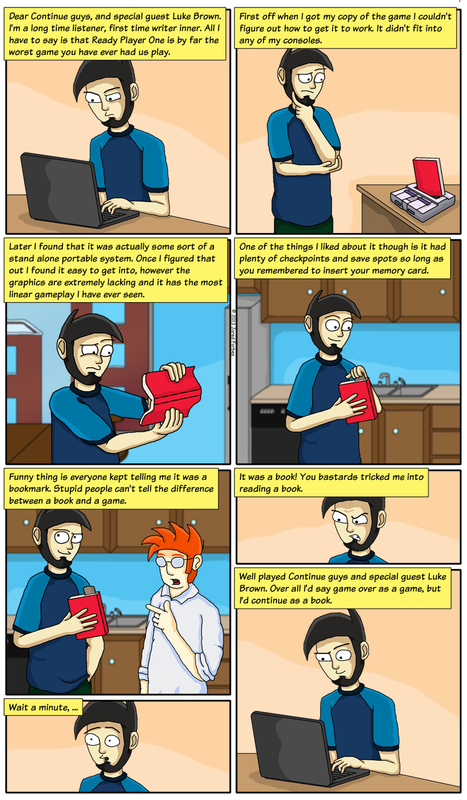 Anywho the Continue guys like to get listener feedback on the games they play for the podcast, and in this occation the book they read, thus today's comic.